i’ve had a pack of pork cheeks in the freezer for ages and have been trying to decide how to cook them. a long slow braise has seemed the most obvious choice but actually it’s not the only option. meemalee’s post about roast pig cheeks is well worth knowing about - an overnight marinating session followed by c30 mins in the oven is all you need to do, and the result is wonderful. 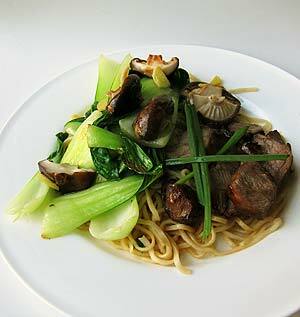 the recipes on meemalee’s blog include both english flavours and a char siu version. it is the latter that i love and have now made a couple of times. above it’s accompanied with a pak choy and shitake mushroom stir fry plus fuschia dunlop’s breakfast noodles, which are made in a really intersting way, based on the you lin (oil sizzling) method, that is widely used in cantonese cooking. the noodles are cooked, drained and placed in their serving bowl then scattered with spring onions (and ginger, if you like). oil is then heated until sizzling hot and then poured over the spring onion and noodles. a bit of soy sauce (often diluted with hot water) is then added and the dish served. it’s incredibly simple but does produce a very particular flavour, which is quite delicious. the method can also be used on things such as blanched green vegetables and steamed fish. marinade the pig cheeks in the rest of the ingredients except the sake/sherry/rice wine for at least an hour - preferably overnight. preheat oven to 180c. place pig cheeks on a grill rack with a tray underneath and pour any excess marinade all over. chuck the glass of booze and a glass of water in the tray, and then place the lot in the top of the oven. after 15 minutes, check the pig cheeks - they should be starting to go brown and even singe a little, but that’s what you want to see. turn them over and turn the oven up to 200c. 10 minutes more and the cheeks should be perfectly tender and roasted with a deep glaze. cover the cheeks with some foil and leave to rest. add some water to the saucy roasted bits left in the tray and reduce into a gravy for the cheeks. slice up the cheeks and serve with your chosen accompaniments.